CineGear Expo, Paramount Studios, LA, May 31 2013 – Academy and Emmy Award-winning developer Colorfront (www.colorfront.com) is now shipping Express Dailies 2013, its high-performance on-set dailies system for commercials, motion picture and high-end episodic HD television production. This latest release delivers a new set of trailblazing productivity features that meet the demand for streamlined end-to-end dailies workflow, including On-Set Live! grading, plus verified copying, faster-than-realtime encoding of multiple deliverables, plus checksum verified ingest, copying and archival via the Copy Central™ capability. 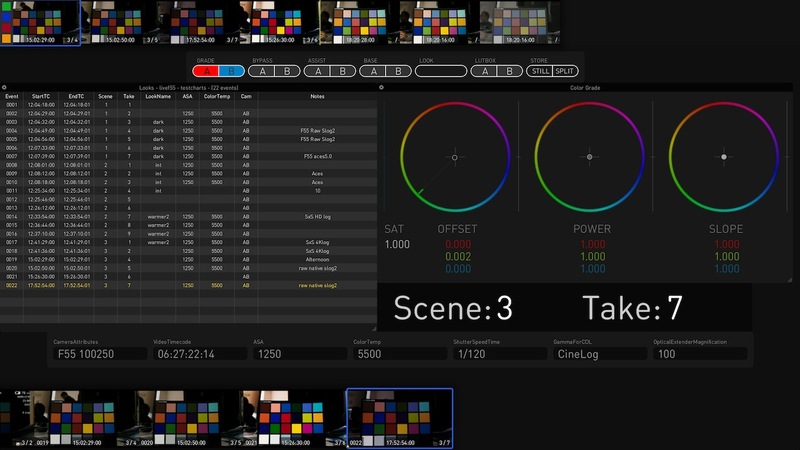 Colorfront is showing the newly-released software at CineGear Expo, Paramount Studios, LA, May 31 to June 2, c/o ALT Systems, Booth #S317, Stage 31. Express Dailies 2013 is built on the leading image-science technology, color grading and management tools that feature in Colorfront’s renowned On-Set Dailies system, now widely adopted on Hollywood features and episodic TV shows. It meets the need for a compact, easy-to-use, high-performance on-set, look-creation and data wrangling tool, and combines production-proven tools for file-based dailies work – including playback and sync, QC, color grading, audio and metadata management – with state-of-the-art color and image science. The new Copy Central capability in Express Dailies 2013 accelerates dailies and deliverables production by offering simultaneous checksum-verified copying to multiple destinations, including LTO archiving, and produces PDF manifest reports. Users can also easily manage media and metadata with a new Bin tool, which includes creation of bins and timelines, advanced sort and search based on all metadata, and file export for easy project management. Integration into color grading and finishing workflows is made simpler than ever with Colorfront’s EMD metadata support, allowing the seamless transfer of project, color and media data through the production chain. Ease-of-use: Express Dailies 2013 has a simple, elegant, drag-and-drop user interface that anyone can use, with integrated waveform monitor and histogram analysis tools for QC, and PDF QC reporting. Control options include support for Tangent’s popular Element grading panels. 64-bit performance: the new 64-bit software runs on Mac Pro tower and retina MacBook Pro workstations. Support for AJA Kona3 and Io XT cards deliver realtime HD video playback and high-quality RAW image de-Bayering, including ARRIRAW and F55RAW. Extensive camera format support: realtime support for all major cameras and formats including the latest digital cinematography cameras from Sony, ARRI, Canon, RED, Phantom, Go Pro, as well as DSLRs. Faster-than-realtime deliverables: sound-sync’d, color graded dailies are delivered faster-than-realtime in all common file formats required for dailies review, post production and archive. These include DNxHD 444 for Avid and all ProRes formats for Final Cut, uncompressed DPX, TIFF, OpenEXR, QT, and H.264 for web-based dailies and iPad. Express Dailies has been used on many popular shows such as Dracula (NBC), Raising Hope (ABC Studios), Body Of Proof (20th Century Fox Television), Falling Skies (TNT), The Selection (Warner Brothers), and Strike Back season 4 (Sky/HBO). Technicolor, Deluxe and Bling Digital are among the first Hollywood production suppliers to make multi-license purchases of Express Dailies 2013. Colorfront, based in Budapest, Hungary, is one of Europe's leading DI and post production facilities. The company was founded by brothers Mark and Aron Jaszberenyi, who together played a pivotal role in the emergence of non-linear DI. The company's R&D team earned an Academy Award for the development of Lustre, Autodesk's DI grading system. Combining this in-depth expertise with a pedigree in the development of additional cutting-edge software, Colorfront offers today’s most advanced technologies for scanning and recording, DI grading, conforming, digital dailies, VFX, online and offline editing, cinema sound mixing, mastering and deliverables. For further information please visit www.colorfront.com.